We farewelled beautiful Banff and headed to Jasper. 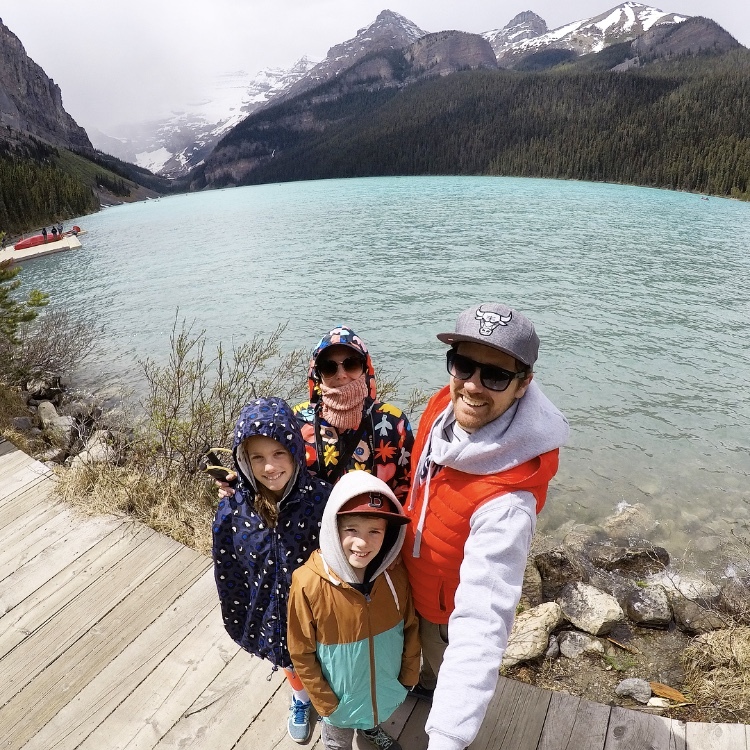 Along the way we stopped off to check out the “must see” sights of the trip – first stop was Lake Louise. We had heard so much about the famous lake. It was very pretty indeed, but being so flooded with tourists made it a little hard to enjoy. One thing we have realised along our travels is just how much we love the “off the beaten track” discoveries. Much more so than the top tourist spots. When we reached Louise – it was freezing, so we were happy to jump back into the car and defrost the fingers and toes after spending a couple of hours in the cool, fresh air. Little boy loving his new sling shot! If Morraine is high on your priority list, it’s best to get there first thing in the morning – before all the crowds roll in. We were driving for only about 5 minutes before we spotted a black Mama bear with her two cubs frolicking on the grassy knoll on the side of the highway. Naturally we stopped to have a good look at them all. So gorgeous – what a high we were on! Our journey continued through the ice fields – up and down the mountains. At one point, we were so high up, the temperature dropped below zero and it started to snow!! We pulled the car over and jumped out for a dance. So ecstatic. The first time the kids had seen snow – and they were experiencing it in Canada – PINCH ME! Making the most of the journey with some school work. As we continued – we spotted mountain goat, elk, and even a lonesome grizzly bear – such incredible animals. The Park Ranger was already road side and wouldn’t allow anyone to stop by the grizzly – so we didn’t get any photos, but we do have it etched into our memory banks. Just before we arrived in Jasper, we stopped in by Sunwapta Falls – A….MAZZZIZNG!!!!! By this point in the day – we were all pretty weary, but we had this place on our list, so we stopped off – and WOW – so glad we did! The most incredible waterfall we have ever seen!!!! HUGE! Another incredible discovery was Peyton Lake. This takes the cake as my very favourite lake from the Banff/Jasper region. It was mind-blowing. The colour of the water was absolutely incredible. The hike up to the lookout through the snow was so special too. The kids had a great time chasing each other with snowballs. We definitely didn’t expect to see snow in Canada in summer – but boy we are so glad we did. Canada ticked so many boxes for us and absolutely stole the hearts of our whole family. We rave about Canada to everyone we meet. A very special place indeed! Our time in Canada had come to an end and it was now time to start on our cross-country tour of the U.S.A! !